The Andes Mountains are the ancestral home of the alpaca genus. Alpacas have been domesticated for at least 6,000 years- making them one of the oldest know domestically raised animals in the world! Members of the Incan civilization raised alpacas for their fleece, which they referred to as “the fiber of the gods.” Inca kings and queens used it for their royal robes. In the 17th century, Spanish conquistadors killed a large portion of both the Incan and alpaca populations. Some of the animals retreated and sought refuge in the high mountain plains, and only the strongest survived. They are the ancestors of today’s best bloodlines- their offspring were hardy and agile and had very high-quality fiber. Peru, Bolivia, and Chile still have the largest percentage of alpacas in the world, but these animals are swiftly gaining popularity in North America, Europe and Australia. In 1984, a small group of importers brought a few carefully selected, high quality huacaya alpacas to the United States and Canada. Suri alpacas were first imported to the United States in 1991. Suris represent roughly 18% of the total registered alpaca population in the United States. Alpacas are members of the camelid family, which also includes llamas, dromedary and Bactrian camels, vicunas, and guanacos. Alpacas are a “modified ruminant” – they chew their cud similar to a cow but have three stomachs instead of four. They eat pasture grasses and hay, so feeding alpacas is relatively inexpensive. Alpacas are very gentle on the environment; they have two toes on each foot which don’t damage pasture land as hooves do. Alpacas have no front teeth on top, so they do no rip out grass by it roots while grazing but maintain a tidy, freshly- mowed look in their pastures. Alpacas do not challenge fences, but fences are necessary to keep out predators. In arid climates, two to six alpacas may be raised per acre of land. In milder, wetter climates, up to ten of the animals can be kept per acre. Alpacas form communal manure piles, which make for easy cleanup. 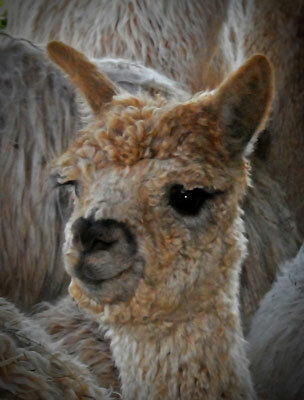 Baby alpacas are called ‘cria’ and at birth usually weigh between 15-20 pounds. 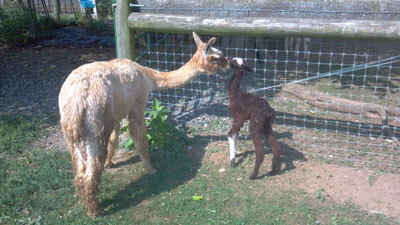 Cria can stand, nurse, and sometimes even run between 30-60 minutes after being born. Births occurs almost exclusively between 10 am and 3 pm. The gestation period for alpacas is 11 to 12 months, and multiple births are very rare. 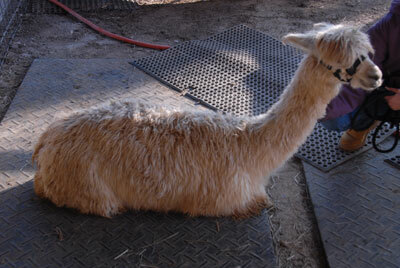 Full grown alpacas are generally about 36 inches at the withers and weight from 100-175 pounds. They have an expected lifespan of 15-25 years. Alpacas learn to halter easily and are intelligent, curious, and graceful creatures with fascinating behavior. They communicate with one another using a gentle humming sound and body language. They rarely spit and are so gentle by nature that if you find yourself spit upon, you probably deserve it.